Boita is elegant typeface created by Mariya V. Pigoulevskaya and published by The Northern Block Ltd which it comes in 5 weights (from Light to XBold). The characters has x-height, baseline, ascender & descender. Also has confident curves, sharp serif and Latin & Cyrillic script support. It merge well on branding, editorial, logo, display but also on web. Enjoy! 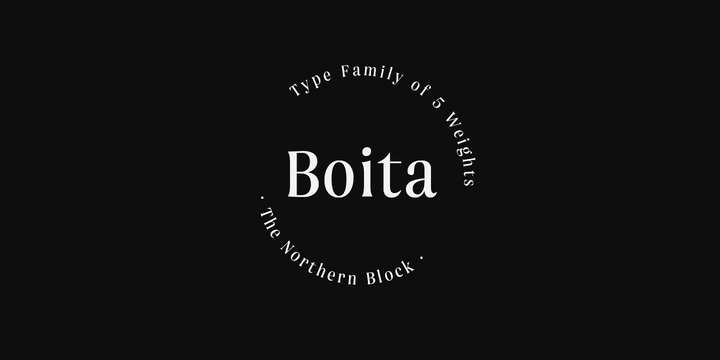 Note: “Boita” is a trademark of The Northern Block Ltd.
A font description published on Thursday, December 8th, 2016 in Fonts, Mariya V. Pigoulevskaya, The Northern Block by Alexandra that has 2,494 views.